Please Bootsy don't hurt 'em! 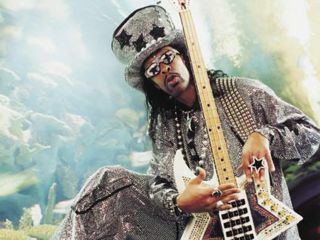 The man with the star bass and the serious funk, Bootsy Collins, produced an exclusive, original theme song that sets the mood for 2K Sports's Don King Presents: Prizefighter videogame, due in stores June 10. To accurately capture different eras of the boxing atmosphere, more than 70 songs appear on the soundtrack, either in their entirety or in truncated ring walk versions. Indelible rock, rap, metal, soul and funk cuts are rampant, from Survivor's iconic Eye Of The Tiger to Run-D.M.C. 's It's Tricky as well as James Brown's Turn Me Loose I'm Doctor Feelgood and Parliament's Give Up the Funk. But it's Collins's original music that scores a fresh knock-out. "Doing the game track was very exciting," Collins says. "It's for Don King, a hero of mine from way back, so I took it very personal when asked to get involved. I felt musically and vocally that this song would place you right in the middle of the game, in a front row seat. I told Mr. King, 'We gonna punch um! Just to make their hair stand straight. Then punch um again, to see the look on their face!'"